K9 Mk I: "The Invisible Enemy" - "The Invasion of Time"
K9 Mk II: "The Ribos Operation" - "Warriors' Gate"
K9 Mk III: "K9 and Company", "The Five Doctors", "School Reunion", "The Stolen Earth/Journey's End"
John Leeson was born in 1943 and after spending time working in a bookshop and then as a porter at Leicester Royal Infirmary he joined RADA. Work in repertory theatre, pantomimes and television soon followed. His appearances on television included Dads Army and the children's show Rainbow where he played the original "Bungle the Bear" in 1972. He was also involved in the setting of the questions in Mastermind. However, it was his involvement in voice-overs which brought him eventually to Doctor Who. He was cast as the Nucleus and as well as K9 in "The Invisible Enemy" and he was also seen onscreen in "The Power of Kroll". He played K9's voice between 1977 and 1981 (except for Season 17 when he took a break from the part). He even agreed to return in the 1981 spin-off programme K9 and Company: A Girls Best Friend along with Elisabeth Sladen and again in the 20th anniversary special "The Five Doctors" in 1983. Since leaving Doctor Who John Leeson has continued to provide voice-overs for the BBC. He also appeared in the 1988 Reeltime Pictures video production Wartime along with John Levene. Born in Yorkshire in 1935 David Brierley has worked in numerous television programmes including Blind Justice, Howard's Way, Tripods, Coronation Street and Juliet Bravo. He played the voice of K9 after John Leeson decided not to continue. However, he only ended up playing the part during season 17 due to other work commitments so creating the opportunity for John Leeson to return for a further season before K9 left the series. He has also been involved in radio and theatre work including The Hound of the Baskerville, Julies Caesar, Romeo and Juliet, and A Midsummer Night's Dream. He can been seen reminiscing, along with John Leeson, about his time as K9 in the 2001 Reeltime Video "K9 Unleashed!". K9 was a mobile computer constructed by Professor Marius of the medical Bi-Al Foundation. He was both a database and huge source of information but also had defensive capabilities as he was equipped with a laser in his nose which could be set to stun or kill. Being in the shape of a dog he was very useful in his ability to sneak up unawares on his foe. In his first encounter, with the Fourth Doctor and companion Leela, K9 was to prove invaluable in helping to defeat the Swarm that was attacking not only the Bi-Al Foundation but The Doctor's own brain. After this encounter, Professor Marius gave K9 to The Doctor as he was no longer able to keep K9 himself. From the outset it was clear that K9 was a computer with a vast amount of knowledge with an even bigger ego to match. "He's very useful; he's my own personal data bank. He knows everything that I do, don't you, K9?" Nevertheless both The Doctor and Leela took an instant liking to K9 and he did not object to the change in ownership in fact he needed no prompting to enter the TARDIS. Somehow the addition of a smug computerised dog with a well-developed sense of his own importance seemed to fit in with the already established team. K9 was to prove to be the perfect foil for both The Doctor's knowledge and arrogance, and Leela's primitive intuition. He also provided the necessary element of humour and he served as an extra 'hook' for the audience, aimed mostly at the younger viewers just as Leela was a 'hook' for the older male viewers. And of course with the success of Star Wars the same year cute robots were the in-thing. K9 though did have a tendency to break down rather a lot as demonstrated when he became damaged prior to the fight against the Fendhal, thus causing him to remain inside the TARDIS for the duration of that encounter. His absence in a number of stories is blamed on corroded circuitry, and being unsuited to the terrain in which the TARDIS took them to. Despite this he was to prove to be a very useful tool. With his laser gun K9 had a tendency to lead the plot into many a battle scene with many laser shots been fired in all directions. Despite being a computer K9 had many human traits and his smugness and tendency to show The Doctor up much to his annoyance. Never liking to be outdone The Doctor, while losing at a game of chess with K9, causes the game to be wrecked when he makes the TARDIS lurch. Leela is also seen to chide The Doctor for calling K9 'him' instead of 'it' something that he had earlier pulled her up on. The Doctor claims that he is allowed to do so as K9 is his dog for which K9 nods in agreement. However, Leela is able to take advantage of The Doctor and K9's love-hate relationship and when in on instance when K9 disagrees with The Doctor's prophecies on the future causing The Doctor to storm off in a huff Leela is seen to kiss K9 on the nose. K9's loyalty to The Doctor is in no doubt as demonstrated in the story "The Invasion of Time", where he is seen following The Doctor's orders to put the Transduction Barriers, that protect Gallifrey from invasion, out of action without question thus allowing the Vardans to invade. Of course this turns out to be a ruse so that K9 can be linked to the Matrix so as to determine the Vardans point of origin and so defeat them. While he was more than willing to obey The Doctor, K9 was not incapable of making his own decisions. He displayed this not only when he joined The Doctor, but also during his travels, such as when he left the TARDIS to search for The Doctor and Leela despite being ordered to remain after their arrival on Pluto ("The Sun Makers"). His ability to make independent decisions was also seen when he decided to stay on Gallifrey with Leela who he knew was very fond and devoted to him. When Leela elects to stay on Gallifrey with one of the Chancellary guards with whom she has fallen in love with K9 announces that he will remain with her and so The Doctor returns to the TARDIS apparently on his own and unaffected by this double loss. However, it soon becomes obvious that The Doctor had been secretly working on an improved model when he is seen dragging into the console room a large box with 'K9 Mk II' printed on its side. Exactly how The Doctor was able to build K9 Mark II was never explained. It can therefore only be assumed that he was able to obtain a set of blueprints from the first K9's memory banks which allowed him to build K9's duplicate. However, while similar to his predecessor the new version had many enhancements including better mobility and the ability to sense danger and respond to ultrasonic signals. He retained, however, that all-knowing smugness, and with the arrival of Romana this meant a whole new set of challenges for The Doctor who had to prove himself to both of them (Although The Doctor allegedly also had a habit of losing K9; according to Romana mid-way through their search for the Key to Time, with the amount of time he’d spent lost before The Doctor could recover him K9 by now would have to be the single oldest coherent matter in the universe, although she may have been exaggerating out of frustration ("Heart of TARDIS")). K9 assisted them both during their search for the Key of Time and it was during this time that all three of them were all trying to outdo each other, and if it meant The Doctor could be proved wrong, then K9 and Romana always joined forces against him, even as their shared loyalty to him was unquestioned. K9 Mk II also had much more involvement than his predecessor, and his abilities were used to the full (A particularly amusing example of this being his ‘duel’ with a robotic parrot belonging to the ruthless Captain in "The Pirate Planet"). He was seen carrying out many varied tasks including tracking, flying aircars as well as fighting, rescuing The Doctor and Romana out of sticky situations and, in the "The Armageddon Factor", he acted as a Trojan Horse for a very small Doctor and Drax. Most of K9's charisma came from his relationship with The Doctor, matching The Doctor’s technical expertise and general knowledge while providing Leela with more relatable explanations and providing Romana with someone else she could talk to. He was perhaps the only one who could undermine The Doctor's 'infallibility' with one smug comment and for an automaton with no capacity for emotional responses, K9 certainly had his fair share of feelings. These ranged from an eager desire to accompany The Doctor and Leela in the exploration of the mysteriously-inhabited Pluto ("The Sun Makers"), regret at his perceived failure to protect The Doctor ("Festival of Death"), calls for assistance after he was left drifting in a lake ("The Androids of Tara"), and even apparent frustration with the TARDIS itself for not being able to speak ("The Invasion of Time"). This is what gave him his personality, and what made him a likeable character and a huge success. Although his mechanical nature still gave him crucial advantages, such as when he spent two thousand years on the planet Aoris during a war between its past and future - once to disarm a bomb planted in the past to destroy a future military bunker and a second time to essentially inspire a cult that would aid The Doctor and Romana in the future - ("The Paradox Planet/Legacy of Death"), K9 was subject to various power depletions and disorders. One unusual occasion saw him somehow contract laryngitis ("Destiny of the Daleks"), resulting in his voice changing significantly for a year. These malfunctions included being nearly melted down, his circuits nearly overloading due to exposure to the higher dimensions ("Tomb of Valdemaar"), and being shorted out when he was accidentally immersed in the English Channel ("The Leisure Hive"). A particularly damaging occurrence seemed to be when he was trapped in a dimensional rift and briefly possessed by The Repulsion, a being of pure death that hated all life and sought access to this universe ("Festival of Death"). Shortly after these events, K9s latest repair saw The Doctor note that he would now need to be recharged every two hours, due to a chronic power depletion problem ("Meglos"). K9 became damaged even further when he has his head knocked off by a marauding Marshman ("Full Circle"), and although he rallied in time to lead a resistance against the vampiric Three Who Rule while The Doctor defeated the Great Vampire ("State of Decay"), later damage caused by the Time Winds surrounding the Gateway between E-Space and N-Space prevented him from continuing with The Doctor. K9 therefore elected to stay behind in E-Space with Romana ("Warriors' Gate"). K9's departure from the television show had many reasons behind it. Mainly it was felt he was being used too often as a rescue device, his function to provide humour was no longer required and with the introduction of Adric the need for a device to explain proceedings was greatly reduced. His departure from the show, however, caused a huge outcry, with many fans venting their fury towards current producer John Nathan-Turner. So much so that in 1981 the BBC agreed to make a Christmas Special. Titled "K9 and Company: A Girls Best Friend" this pilot, of an envisaged series, involved a K9 Mark III being sent to Sarah Jane Smith as a present from The Doctor. The two of them became involved battling black magic and the occult in a small English village. 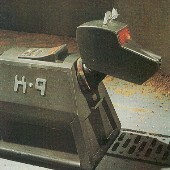 The planned series was never produced past the pilot but it did allow for K9 Mark III to make a brief appearance in Doctor Who proper in the 1983, 20th anniversary story "The Five Doctors", where he attempted to warn Sarah of great danger just before she finds herself transported to the Death Zone on Gallifrey and reunited with the Third Doctor and The Brigadier, along with fellow companions Susan, Tegan Jovanka and Turlough, and the First, Second and Fifth Doctors. He also aided Sarah when investigating the activities of the mysterious Remote (“Interference Book One” and “Interference Book Two”), during which he and Sarah encountered the Eighth Doctor. As later revealed in the novels, K9 Mark II was eventually restored to his original universe when Romana returned to Gallifrey and was elected President of the High Council, subsequently working with Mark I to find information about the missing House of Lungbarrow - The Doctor’s old family home ("Lungbarrow") - as well as aiding Leela, Romana and current companion Charley Pollard when they attempted to rescue The Doctor from Rassilon’s attempts to turn him into a weapon against an ancient race ("Zagreus"), both K9s working with Romana and Leela against the ancient Gallifreyian Imperiatrix known as Pandora, who manifested using the form of Romana’s first incarnation. Although Mark I was destroyed during the Gallifreyian civil war against Pandora, Mark II briefly returned at the conclusion of "The Gallifrey Chronicles", where it was revealed that he was transported into the TARDIS prior to Gallifrey’s destruction with orders to kill The Doctor in an attempt to defeat Grandfather Paradox - The Doctor’s corrupted future incarnation and leader of the attack on Gallifrey - only to be trapped in a distant part of the TARDIS. When The Doctor finally discovered K9, he initially tried to kill The Doctor, but changed his mind when he learned that The Doctor at least partly saved Gallifrey by downloading the Matrix into his subconscious mind (Albeit at the cost of his own memories as he was forced to erase them to create room), K9 noting with satisfaction that ‘The Doctor-Master never loses’. Although The Doctor stated that he had sent K9 to contact the mysterious Madam Xing ("Halflife") at the conclusion of the novel - most likely to seek a means of transferring the dormant Time Lord memories in his mind before restoring his own memories - this K9’s final fate is unknown. The most likely explanation is that, having returned with a means of allowing the Eighth Doctor to remove the Matrix from his mind and restore his own memories, K9 was left with the Eighth Doctor’s current companions Fitz Kreiner and Trix MacMillan - who had decided to leave the TARDIS to start a new life together - as a housewarming present. K9 Mark III returned to the television series when he aided Sarah and the Tenth Doctor in defeating the alien goings on in a local school ("School Reunion"). Although he was forced to sacrifice himself to defeat The Krillitane invasion, The Doctor left Sarah with a rebuilt version of K9 that retained the original’s databanks and memories while providing Sarah with various new tools, including a ‘sonic lipstick’, while also possessing such new features as the ability to teleport. Due to copyright debate, K9 Mark IV is generally absent from The Sarah Jane Adventures, his absence being explained by saying that he is operating ‘outside’ of time to negate an artificially created black hole. Despite this, he has returned to aid Sarah on two occasions, helping her to reprogram the renegade ‘Mr Smith’ - an alien computer who had turned against Sarah when his original programming was activated ("The Lost Boy") - and subsequently providing the reprogrammed Mr Smith with the TARDIS base code, allowing Mr Smith to connect the TARDIS to the Cardiff Rift and thus permitting The Doctor to use the Rift to tow Earth back to its proper place in space and time after it was ‘stolen’ by the Daleks ("The Stolen Earth/Journey's End"). K9 eventually returned to Sarah's life full-time when the black hole he was monitoring was drained away to provide power for a crashed space ship ("The Mad Woman in the Attic"), attending Sarah's aborted wedding - during which he was reunited with the Tenth Doctor when aiding The Doctor and Sarah's friends against the Trickster - ("The Wedding of Sarah Jane Smith") before he left to accompany Sarah's son Luke when he went to Oxford after taking his exams early ("The Nightmare Man"). Throughout his time with The Doctor, K9 remained irritatingly smug and invariably right. He also left the show at the height of his popularity, and because of this he remains a fond memory.